Stockton law firm Endeavour Partnership has donated £7,500 to Fairbridge House, the Middlesbrough centre of the Prince’s Trust charity. Last year the team at Endeavour took on the fundraising challenge, supported by the Middlesbrough and Teesside Philanthropic Foundation. Endeavour raised the sum in a variety of ways including sales of planners, featuring iconic local images and photographed by one of Endeavour’s team- keen photographer Nick Dent, sponsored walks, bake-offs and the Transporter Bridge challenge, which saw 15 of the team climbing the 210 steps to the top of the bridge. The funds raised by Endeavour were match-funded by the Middlesbrough and Teesside Philanthropic Foundation, meaning that a total of £15,000 has now been donated to Fairbridge, which provides training and educational opportunities for 16 to 25-year-olds. All of the 50-strong team at Endeavour Partnership took part in the activities, organised by Martin McKinnell and Catherine Devereux who are responsible for the firm’s corporate and social responsibility and fundraising efforts. 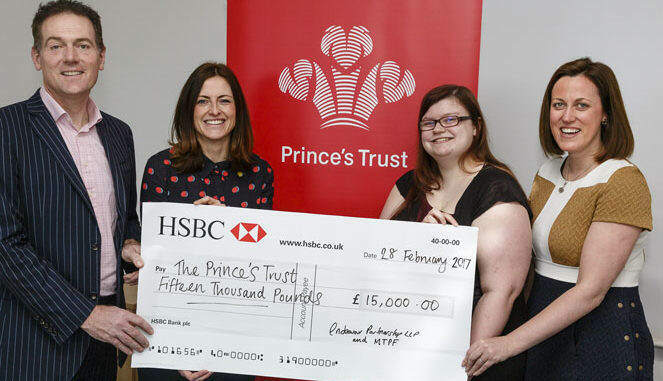 Devereux said: “We are really proud to support the Prince’s Trust and we are thrilled to have been able to raise the level of funds we did. Endeavour Partnership employs a team of 50 and has a reputation spanning over 16 years, providing expert advice on a range of business law matters including mergers and acquisitions, intellectual property, employment, commercial property and corporate recovery and insolvency from its headquarters at Teesdale in Stockton.